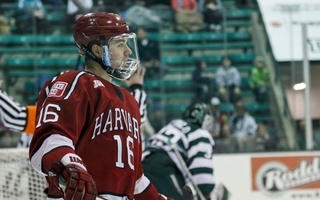 For Harvard men's hockey junior John Marino, hockey and brotherhood are one and the same. An examination of Marino's relationship with his twin brother, Paul, reveals how hockey and family together shape his life. 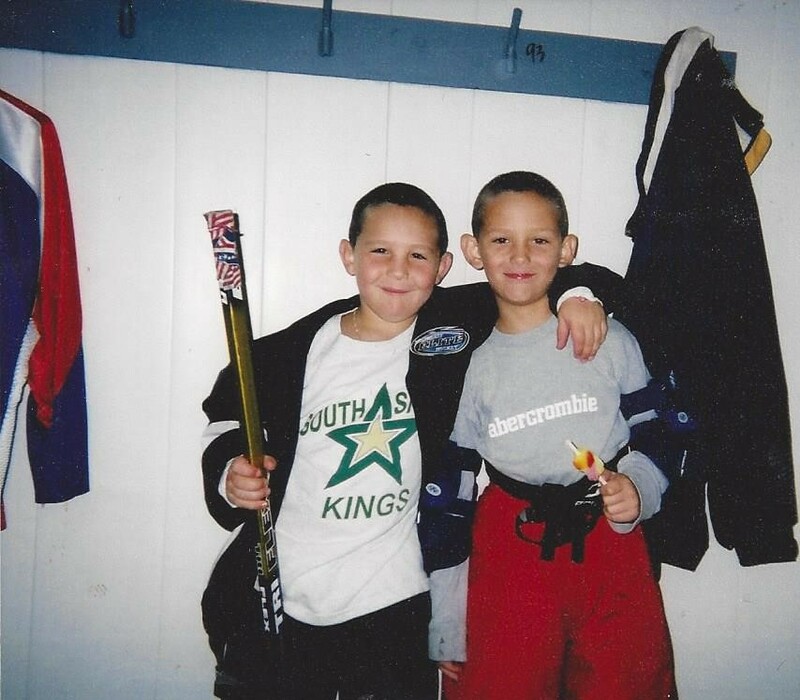 John Marino (right) owes his start in ice hockey to his brother, Paul (left). Since hitting the ice with John at 18 months, Paul has been a steady presence in John's life in and out of the rink. 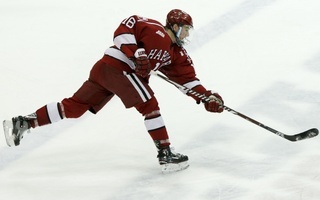 Few people on the periphery of the Harvard men’s hockey team truly know John Marino. Of course, they know that he wears No. 12, plays a sturdy two-way game on the Crimson’s blue line, and is a prospect of the National Hockey League’s Edmonton Oilers. But they don’t really know him. And it’s easy to see why. The junior keeps a low profile and maintains a steady composure on the ice. His impact might not always show on the score sheet, and he certainly isn’t seeking out the nearest microphone. John’s demeanor disguises much more than his inner drive. During John’s time in Cambridge, there has always been a grander story that has obscured his talent and personality: a senior-led team reaches the Frozen Four in 2017; then, Ryan Donato shines on the college, Olympic, and NHL stages in 2018. But the North Easton, Mass., native has one of the more noteworthy college experiences within the Crimson program. While John puts in the work on the ice, in the film room, and in the weight room, his twin brother, Paul, is busy splicing and preparing video for the team. Interestingly, it is Paul who was indirectly responsible for introducing the duo to hockey, one of the most important facets of the twins’ lives. From that moment on, the Marino twins shared a bond over the game of hockey that, in part, has defined their relationship as brothers. "Every once in a while, we'll still get on the ice together, and it's fun and it's somewhat competitive. Not really." 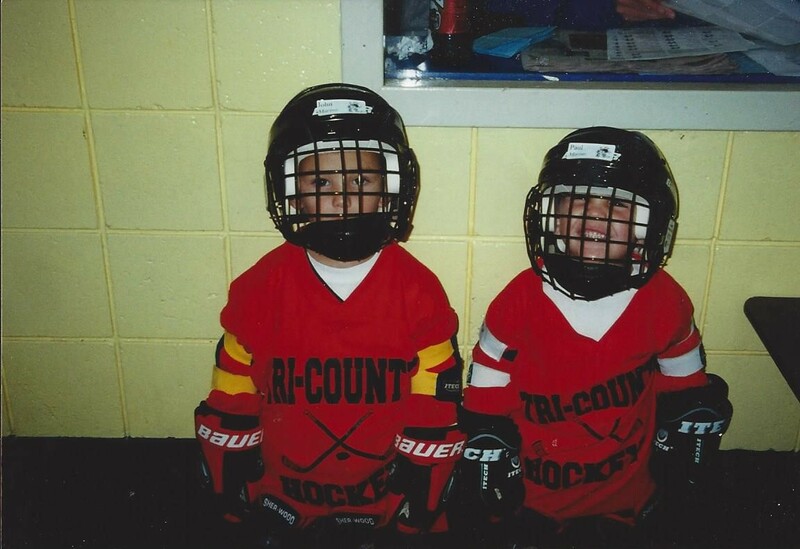 After learning to skate together at such a young age, John and Paul competed on the same team for the South Shore Kings hockey program. Eventually, John broke out as a young player and began “playing up” with older teams — not the least bit unusual for precocious skaters. While John was skating with top competition, Paul was often watching from the stands. There, coincidentally, he got to know coach Donato, who was at the rink supporting his own sons. Paul credits much of his passion for hockey to his rink-side chats with coach Donato, as well as with Peter Chiarelli ’87, formerly the General Manager of the NHL’s Boston Bruins and currently the Oilers’ GM who drafted John in 2015. Coach Donato looks back fondly on his early relationship with the Marino twins. He recalls John playing on a local “superteam” of sorts, containing much of the elite talent from the Massachusetts area in recent years and giving rise to multiple NHL mainstays. The Crimson bench boss also remembers Paul’s leg injury, which played a part in keeping Paul in the stands while John thrived on the ice. John will once again bring his two-way prowess to Harvard's blue line in 2018-2019. In 68 games through his first two collegiate seasons, he tallied 31 points (4–27—31). In typical brotherly fashion, Paul broke his leg while racing John, sliding feet-first into the boards in a desperate attempt to prevent his younger twin from winning. By the time John and Paul were teenagers, their relationships with hockey had clearly diverged: John continued to pursue top competition on the ice, while Paul took more of an interest in the cerebral side of the game. Whether playing, watching, or discussing hockey, the sport has seemingly always been a central element in the brothers’ relationship. Plus, the game introduced the twins to coach Donato, opening doors for both Marino boys to be a part of the current Harvard program. "Well, let's try this again for another four years." For John and Paul, spending another four years together at school has been a privilege, but one that they scarcely expected. John originally committed to Yale after bonding with an assistant coach there but rescinded his pledge after the coach left the program. Shortly thereafter, John signed at Harvard. Meanwhile, Paul’s performance in high school put him in academic contention for a spot in the Crimson’s class of 2020, so he took his chances. When Paul learned of his acceptance, it took all of 10 seconds before the reality sunk in: he would be reuniting with John, who had been living away from home while skating for the Tri-City Storm of the United States Hockey League. The two twins, who had spent most every day of their childhoods together, would not yet have to part ways. Both brothers benefitted from having a very familiar face around campus, especially in the early days of their freshman year. When the duo finally arrived on campus, John’s schedule was, predictably, devoted primarily to hockey. Paul, on the other hand, had more options when it came to activities outside of school. With passions for both hockey and statistics, he reached out to the Harvard coaching staff in search of an analytical role with the team. Thanks to a longstanding relationship with coach Donato, as well as the skill set to perform the job, Paul was the team’s video manager from that point forward. With such close ties to the Crimson program, it’s no surprise that John’s and Paul’s social lives overlap extensively, too. The brothers are in a Dunster House blocking group rife with hockey players, and they mingle with more or less the same friend group. "Paul's been answering questions for me since I was a little kid." As much as the twins’ Harvard experiences are similar, in some respects John and Paul could not be more different. Stretching after practice one September afternoon, senior defenseman Viktor Dombrovskiy laughingly forewarned that an interaction with Paul would be vastly different than one with John. Most obviously, Dombrovskiy was referring to the brothers’ distinct social presences: John is quieter and more reserved, whereas Paul is notoriously outgoing and talkative. In fact, Paul is often the more loquacious one even around John’s teammates. Few people on the periphery of the Harvard hockey program truly know John Marino. His twin brother, Paul, knows him better than anyone, as he has been there for nearly every step of John's journey, hockey or otherwise. When it comes to chatting about hockey, John is particularly hushed. When his hockey commitments are over for the day, it’s the last thing he wants to talk about, despite Paul’s analytical appreciation for the sport. Routine brotherly antics add a unique element to John’s hockey experience at Harvard, as well as to that of his teammates. Paul is known to call out John for a variety of academic, social, or hockey-related matters in front of the team, precipitating cheers and laughter from the players within earshot. "We both know that we're better together than we are apart." John Marino’s story is more interesting than his quiet and private demeanor might let on. 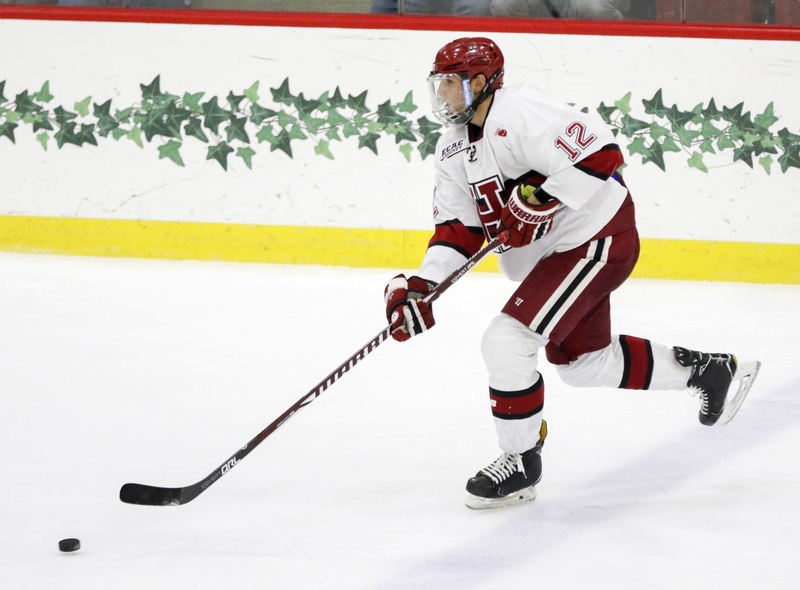 While John logs big minutes for the Crimson squad and will only assume a larger leadership role this season, it is his extroverted twin brother, Paul, who provides a unique way to get to know the blue-liner. After all, Paul has been there at every phase of John’s life. He was on the ice with John when the twins laced them up for the very first time. He was consistently in the stands cheering on his brother and picking the brains of great hockey minds like coach Donato, John’s eventual NCAA bench boss. 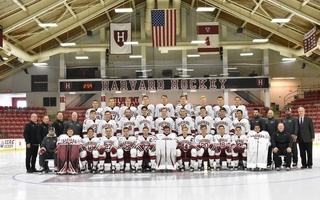 And now, he roams the halls of the Bright-Landry Hockey Center, rides on the team bus, and hangs out around the locker room, experiencing Harvard hockey alongside his younger twin brother. “Hockey has definitely shaped both of our lives in indescribable ways,” Paul began. “The amount that I’ve fallen in love with the sport and the success that John’s had, it definitely changed a lot.